These bags are made in India out of jute (also commonly known as hesian). This is a soft, long shiny vegetable fibre which is easily spun into strong threads which are often made into rope. Used across Latin America, Africa and India and becoming increasingly popular in the West as a sustainable alternative to plastic. 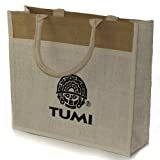 These jute bag have the Tumi logo on them and ideal for gifts of all sizes. Tumi was founded in 1978 promoting fair trade crafts and goods, working closely with organisations such as Traidcraft and Oxfam Trading. Tumi has worked with our partnersfor many years and ensures that we pay a fair price (set by our partners), good working conditions and a sustainable future for our workers and their children. Thank you for being part of this. This entry was posted in Luggage and tagged Available, Bags, Fair, from, Gift, India, Jute, many, Perfect, Sizes, trade, Tumi by Bottled Sun. Bookmark the permalink.